I should preface this post by saying I have friends that are teachers and they are excellent at what they do. But as in every profession you will have a good number of bad apples. As anyone who has been out and about this week would have heard, a smart kid got arrested for making a clock. We live in a culture that celebrates the empty headedness of the Kardashians rather than celebrate and encourage kids to use their brains. So a 14 year old who is smart and mechanical made a clock. The teacher decided it was a threat and it escalated from there. He gets hauled off in handcuffs and while charges were dropped he is still suspended! What should have happened, instead of the knee jerk reaction the teacher went with, was the 14 year old brings in a homemade clock. The teacher not understanding should have taken 5 seconds to ask the student what it was. Why it’s a clock, and I made it. Oh cool. End of. But no, school security is called then the police. What I find incredibly sad is not once did common sense prevail. You have several adults involved up to the point he is removed from the school and no one thought anything was wrong with this scenario. And the school is saying now they did nothing wrong, they even sent home a memo patting themselves on the back, and they claim they can give him a good education. If this happened to my child they would not go back to this school. And you wonder why we’re in the state we’re in. On the flip side it is heartwarming to see MIT, NASA, and even the White House supporting him. I bet he’ll go far. The other night I needed a quick meal for my husband and I. Because of my back and hip, I can’t walk both dogs so I have to wait for my husband to come home. Which means some nights we are looking at a late dinner. Therefore I need something that can cook quickly but still be delicious. We had some ground beef to use up so I bought large portobello caps and planned on doing a stuffed mushroom with Mexican flavours. I am finding with the days getting shorter I’m losing the light! Natural light is so important for photos but alas unless I make dinner at lunch time I’ll be out of luck. In a skillet with a bit of olive oil brown the ground beef. Chop up some onion, garlic, sweet pepper, and hot pepper. Saute to soften the onions. When the meat is halfway cooked start cooking the mushrooms at 350F/175C. Because the mushrooms are big they can take awhile to cook. Add a few mushrooms, sliced, to the meat mixture. Season with chili powder, cumin, salt and pepper, and hot sauce. The amounts are up to you depending on how hot you want your dish. Add a splash of lime juice and some cilantro. Spoon the mixture onto the mushroom caps and top with shredded cheese. Bake until everything is heated through and the cheese has melted. Top with salsa and sour cream to serve. As a parent there is always the worry that your child will resent you for being, well, a parent. I constantly worry about that being a step-parent. Yesterday, as my son and I were going a few rounds of I forgot my water bottle at school and I forgot my homework, he showed me what he had to do for writing a short paragraph. The assignment was to write about what he appreciated. It was all about how he appreciated his two moms because we help with his homework, we care, we teach him street smarts, and we love him. You can not stay annoyed with your child when presented with this! I even missed the words that were misspelled. Does he know how to play me or what? LOL It also means the world to me when I get to read stuff like that. Being bonus mum to our two kids is such a gift. This past Monday, in the spirit of Cinco de Mayo, I thought I’d make homemade tostadas. 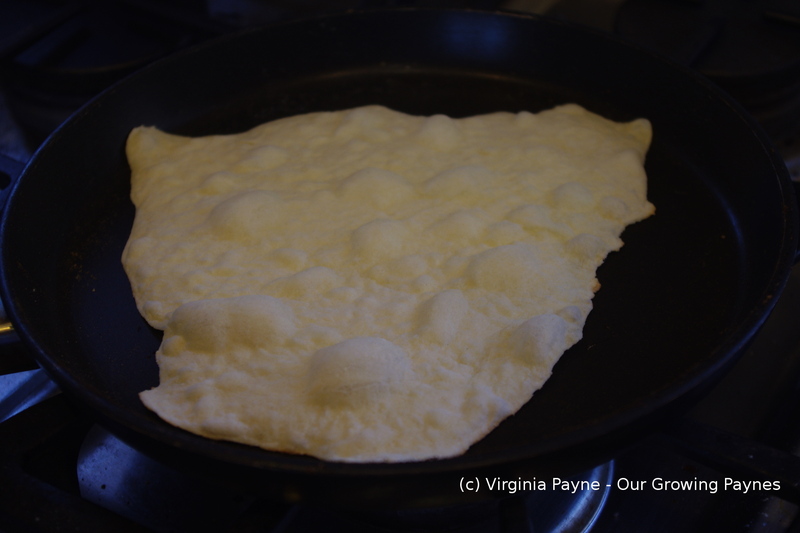 I’ve been playing round with fresh corn tortillas but haven’t really liked them. Well I should say they worked for soft tacos but I was underwhelmed with the flavour. I was wondering if I was doing something wrong. Recently we went to an authentic Latin restaurant that had amazing food and wouldn’t you know it, I’ve been making them correctly! So I decided to play with adding some ingredients to punch up the flavour first. Before we get to the tortilla bit the meat has to be prepared first. I chose to slow cook the steak in the oven like I did with the pulled pork. Preheat the oven to 300F/150C. I did a quick mixture of 2 tablespoons of chili powder, a couple of teaspoons of cumin, salt and pepper, and a few dashes of adobe seasoning. Rub the steaks and put into the baking dish. Add 1/2 a cup of chicken stock and a couple of tablespoons of fresh lime juice. This needs to cook for about 4 hours. Like the pulled pork you want the meat to easily be shredded. This is the most difficult part of the dish. So you can see this is an easy dinner to make! I wanted to make twelve tostadas about 4in/10cm in diameter. In a bowl add 1 1/2 cups of masa, a tablespoon of chili powder, and a pinch of salt. For the liquid you need a cup. I added a tablespoon of lime juice and then the rest was water to make up that cup. 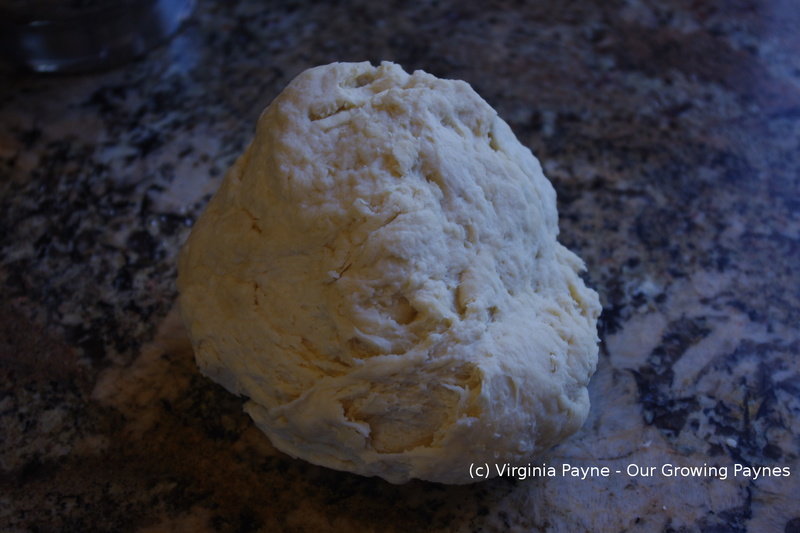 Mix well and then knead until the dough is fully incorporated. Divide into 12 equal pieces and form them into balls. 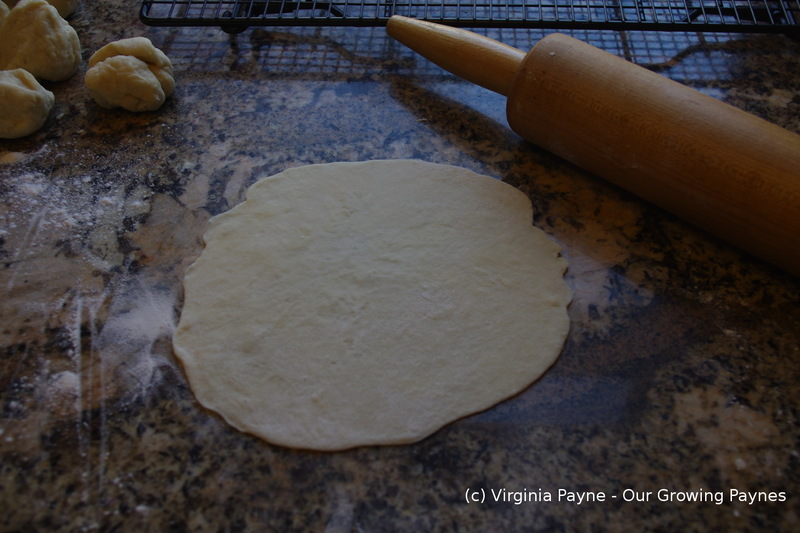 Line both sides of the tortilla press with cling film and place a ball of dough in the middle. Heat up a dry skillet on medium high. Cook the tortillas about 30-45 seconds on each side. They will puff a little bit and start to brown. Wrap the cooked tortillas in a tea towel until it is time to fry. This keeps them warm and soft. Set aside as you prep the rest of the meal. Shred the beef and add chopped pepper and onion to the beef and cook for a few minutes. Keep the beef warm while frying the tortillas in vegetable oil. 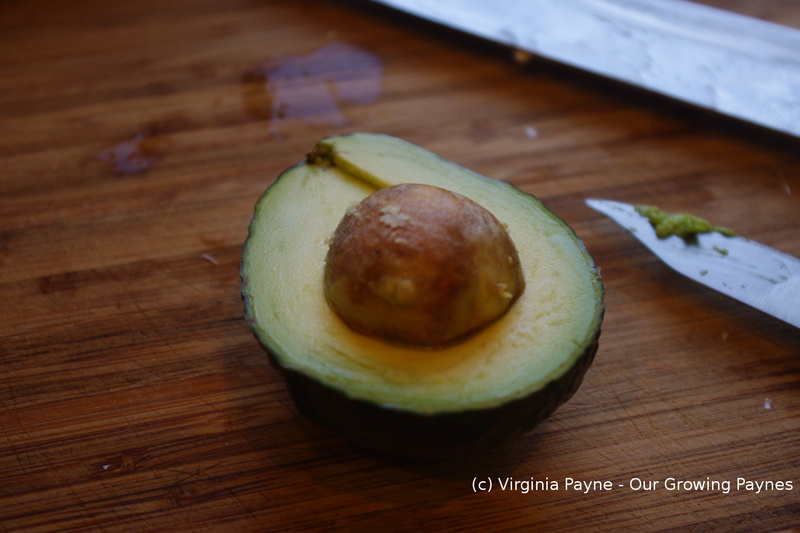 As you fry them transfer them to a plate lined with kitchen roll. Once done layer all the ingredients. For mine I layered sour cream, cheese, salsa, tomato, lettuce, and avocado over the beef. This was a fun meal to have. It is super easy to make and it’s fun for the kids to assemble their own with what they want. And the lime and chili in the tostadas worked really well. If you are a parent you know watching your kids grow is fascinating, sometimes frustrating, and most of the time a wonderful thing to watch. You also know it isn’t a continuous curve of growth. They’ll tick a long and suddenly there is a leap forward. Our daughter tried out for the Honors Band for our state. They pick the best 8th graders to participate. Last week they had the day of rehearsal and they practice all day long before the concert. A lot of hard work went into the pieces they performed and I was blown away at how well they did. The music was very technical and sounded excellent. I was sitting there thinking how far she has come in just a few years. She is really coming into her own on so many levels. It is a joy to watch. Our son has been making leaps of his own. We had a great parent teacher conference last week. He’s seeing the result of hard work in his report card and his teacher is encouraging him to speak up for the class. Apparently a student at school was wiping the white board and posters have gone missing. So the principal made an announcement to the whole school that the 5th grade can no longer move about the school without a teacher. My son thought this terribly unfair so his teacher is encouraging him to meet with the principal to discuss this. What a great opportunity! His teacher said to us that he was confused about the way the issue has been handled so we are all curious what the answers are going to be. I bought some chicken thighs to do a Spanish dish called Pollo a La Española that I found in a cookbook I found at our library sale. It’s called The Complete Spanish Cookbook by Pepita Aris. It’s a mild but flavourful dish and relatively easy to make during the week when it is hectic. In a large skillet heat up a couple of tablespoons of olive oil. 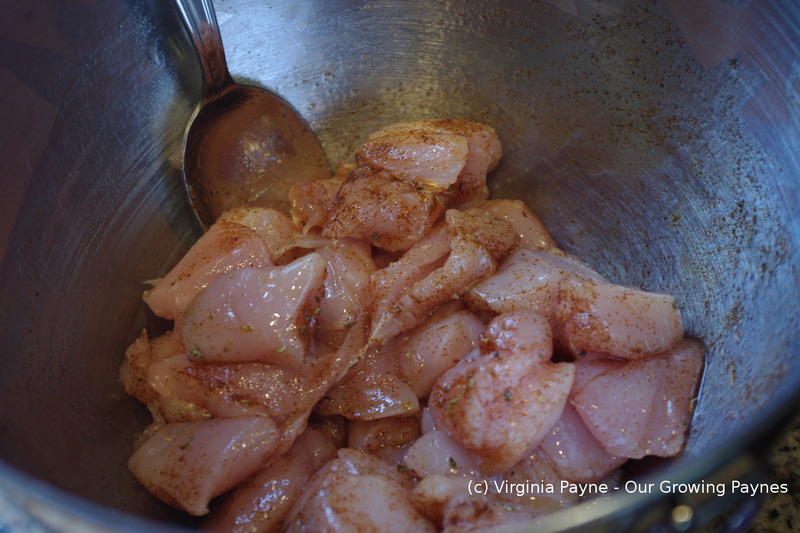 Rub paprika on all sides of the chicken thighs and season with salt and pepper. Pan fry both sides to brown. Place in the oven to finish cooking. In the skillet add about 3/4 cup of finely chopped onion, 3-4 cloves of garlic chopped, and a 1/2 cup of pancetta. I use uncured pancetta and sometimes it doesn’t have the full saltiness. Just something to keep in mind when adjusting the seasoning. Cook until the onions soften then add a 14 oz can of diced tomatoes and a few teaspoons of fresh thyme. I added this because we didn’t have any parsley like the recipe called for. Stir and bring to a simmer. Add about a cup of chopped bell peppers. I love how colourful this dish is. Adjust the seasoning with paprika and the salt and pepper. Serve with rice of your choice and enjoy! On a side note, it seems I can no longer do my posts in the classic mode. Not thrilled with that and I’ve noticed that pictures I post are showing as smaller than they showed before. The files sizes are the same as before. Any idea on how to fix that? I wonder sometimes about how bad my “senior” moments might get when I am actually a senior. We all have them. But there are times where I just want to do a facepalm. The gas for our grill ran out this weekend so we had to go to the home improvement store to switch out the tanks. And we figured we’d get a couple of things while we were there. Off we went. We could remember the couple of things but we knew we were forgetting something. We racked our brains all the way to the store, finally it came to me. The gas tank! Honestly, the whole reason we were going there in the first place. And being used to grilling in the summer it was weird the past few days not having that tool to use. But we’re back in business! I’ve been wanting to try to make Mexican street corn for a few months after my husband had tried it during a trip to Texas. I was surprised it had mayo as my husband generally avoids mayo but he said it really worked with this dish. After checking many recipes I realised that it was pretty basic across the board but I chose this recipe as a reference. The queso was very expensive and I couldn’t find cotija cheese. So I did a bit of research at the store, isn’t technology wonderful? Parmesan is a good substitute for aged cotija cheese and you can use it for this recipe. For the softer cotija cheese a good substitute is feta so I bought that. Buy the crumbled version as it just takes out a step. Fire up the grill and once it is very hot start grilling the corn in the husk that has been soaked. In the meantime prep the ingredients. Finely chop a good handful of cilantro. I was only doing two corn cobs so I did about 2 tablespoons worth. 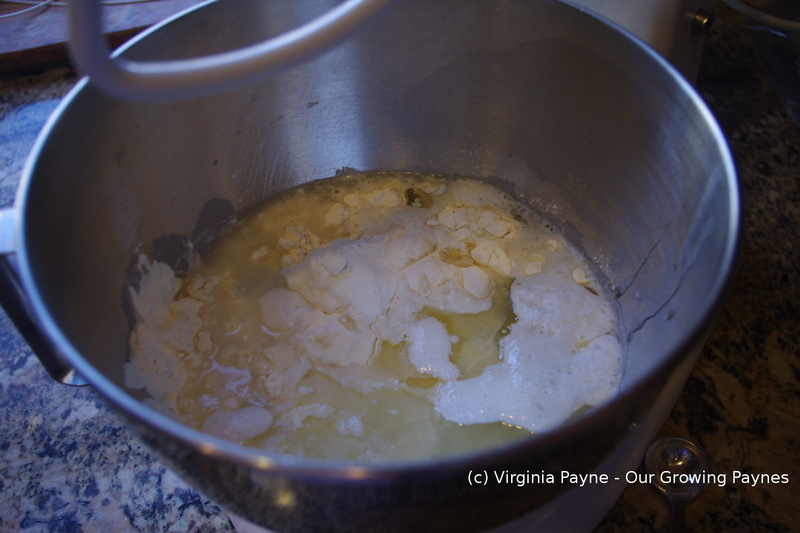 Also prep about 1/2 a cup of the feta making sure the crumbles are small and fine. After about 10 minutes on the grill remove the husks and put them back onto the grill to roast. Remove once the corn is cooked and spread butter around the corn so it melts in. Then spread mayo over the corn. Sprinkle the corn with chili powder and the cilantro. Press the cheese around the corn. Sprinkle more chili powder to taste. 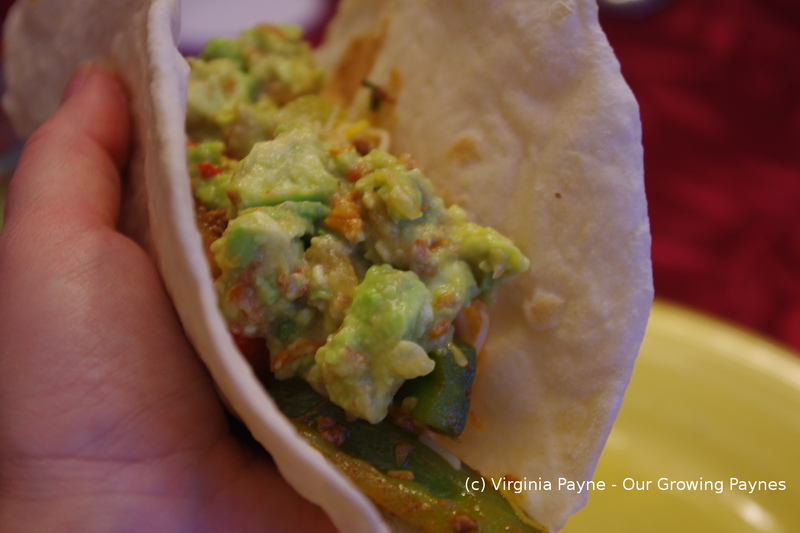 Serve with lime wedges to squeeze over the corn. I have to say the mayo really works with this. I’ll have to make this for the kids when they get back from camp. With putting the salad together and doing the corn it took about a 1/2 hour to make so it’s a great dish when you are busy. 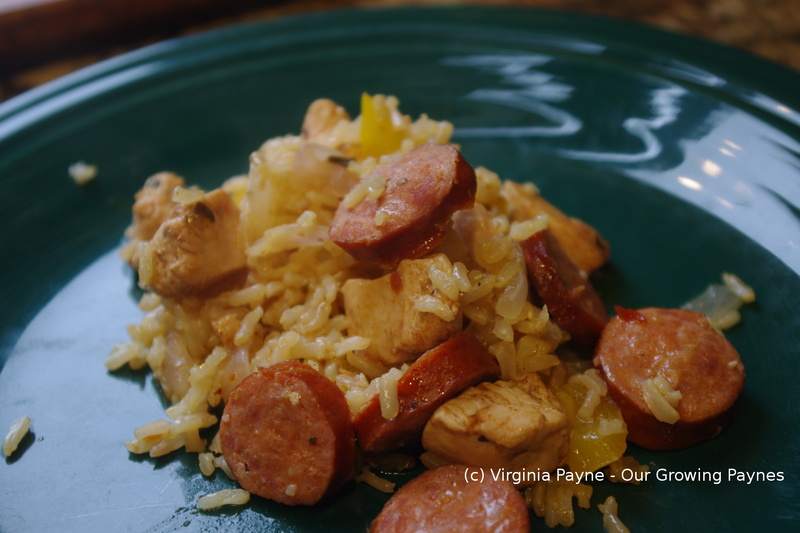 I found a recipe for an Easy Paella to try with chicken and chorizo sausage. While this wouldn’t be a traditional paella it does have a lot of the flavours and it takes about an hour to make. Traditional recipes can take 2 hours to make. I didn’t include the shrimp as half of us don’t like seafood but it can easily added to the dish. I also used brown rice as that is what we had on hand, it takes a little longer to cook and doesn’t show off the saffron as much but works well. I cubed 3/4lb of chicken and tossed it with 2 tablespoons of olive oil, a tablespoon of paprika, a couple of teaspoons of dried oregano, and salt and pepper. Chill in the fridge while prepping and starting the rice. 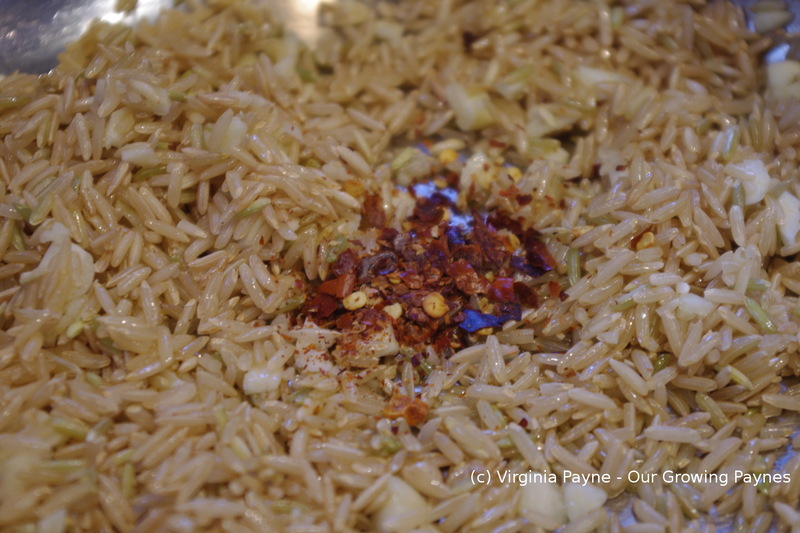 In a large skillet that has a cover heat a couple of tablespoons of olive oil and saute the rice. I used a cup of rice as there was only four of us. 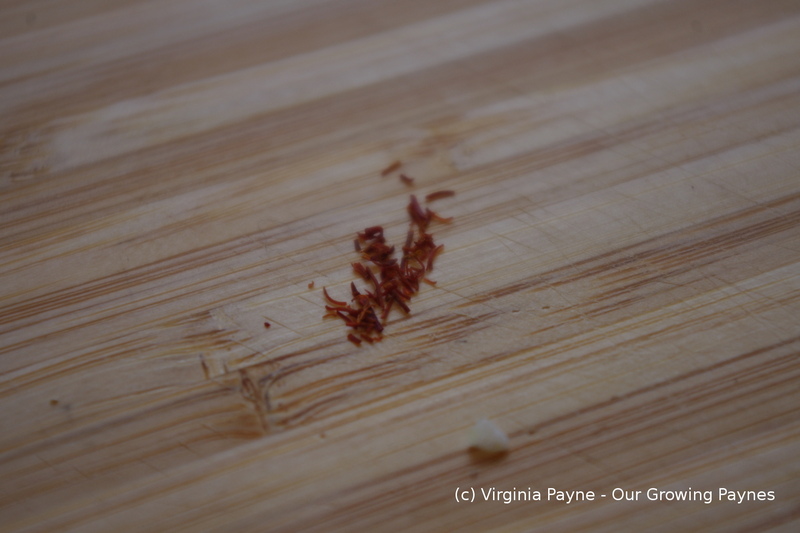 Add 3 cloves of chopped garlic, and a teaspoon or so of red pepper flakes. Cook this for a couple of minutes. Add chicken stock in the amount that is needed for the rice you use. For this dish I needed 2 cups of chicken stock. 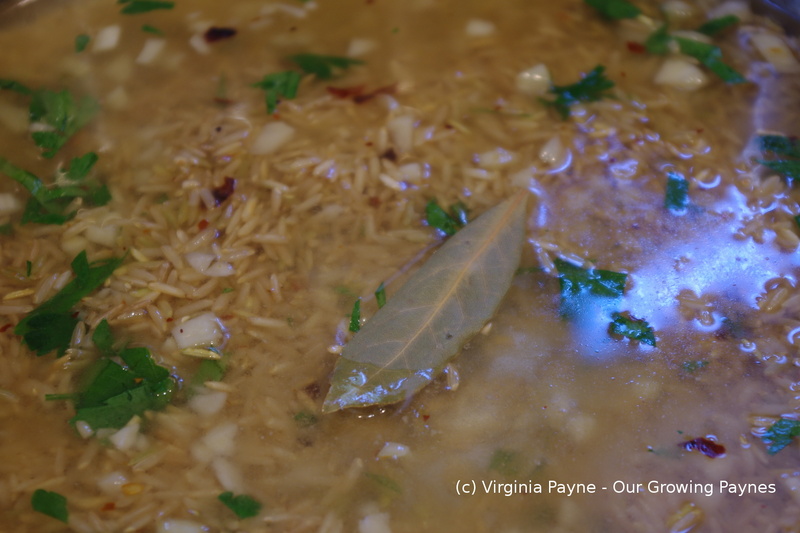 Add fresh flat leaf parsley, a bay leaf, and a few squirts of lemon juice. The recipe called for lemon zest instead and I would normally use that but I couldn’t find organic lemons at the store so I went with the next best thing. Bring to a boil then cover and then lower the heat to a simmer. About 10 minutes or so before the rice is finished cooking chop up half a red onion and a bell pepper. 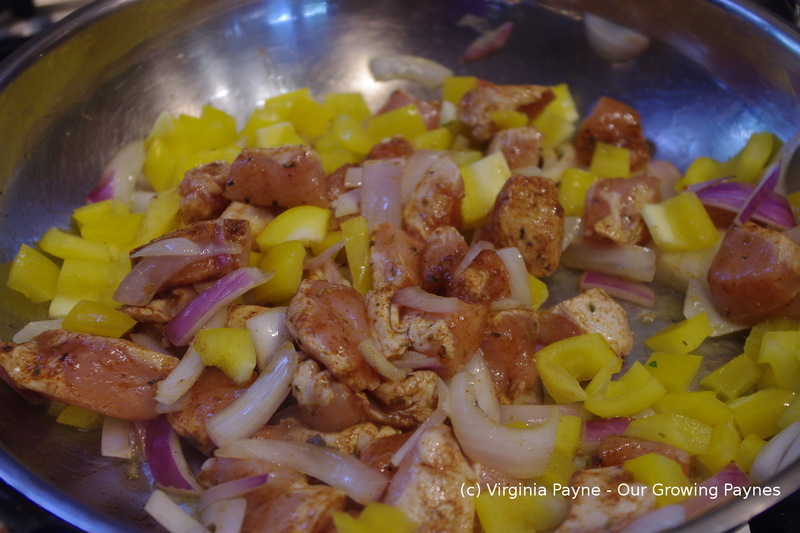 Saute the chicken, chorizo sausage, pepper and onion in olive oil. Add to the rice and finish simmering. Once the rice is cooked it is ready to serve. I’m curious about the root of this dish as it’s not far off from a gumbo. I have a feeling that a cousin of paella made it’s way to New Orleans at some point and influenced the gumbo. 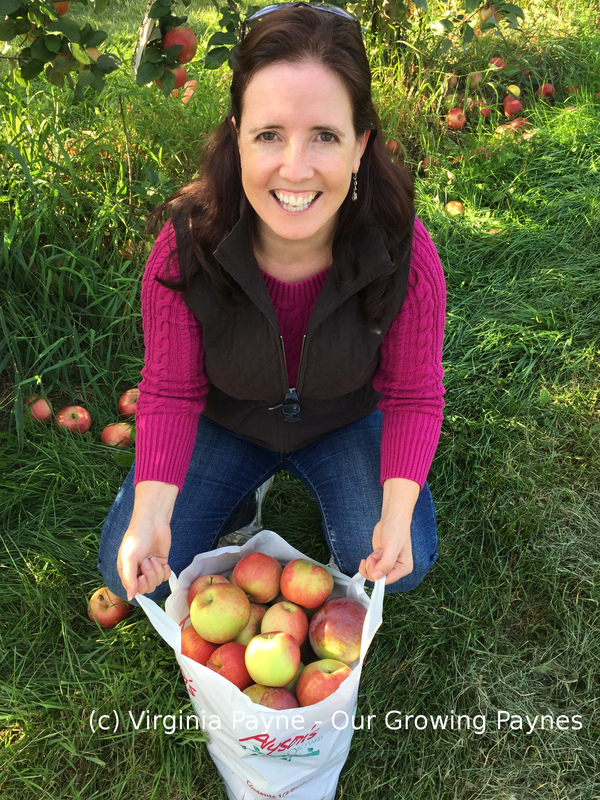 I find it fascinating the journey of global food. 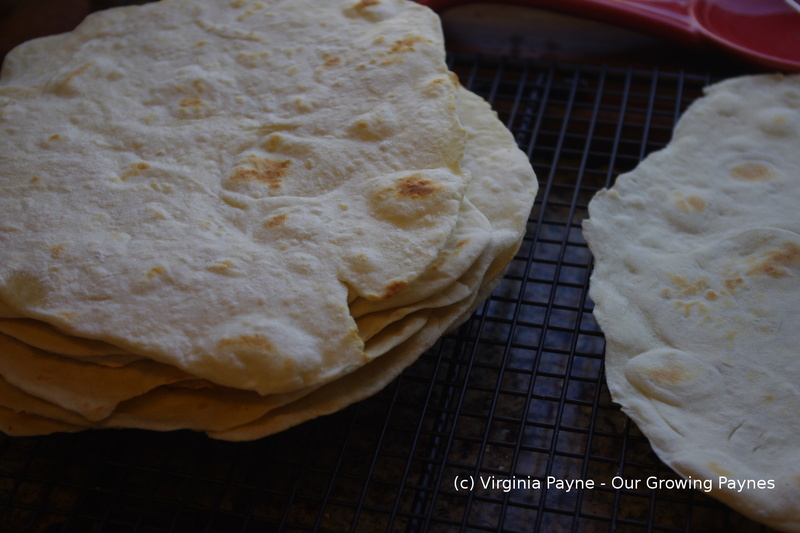 Quite a while ago now I pinned some tortilla recipes swearing I would try them but never got round to it. The whole time flying by would be the excuse but not a very good one. I mean I’ve posted some complicated recipes so I can’t say I never had the time to try them out. For my birthday I asked for a tortilla press because I hadn’t read the flour tortilla recipes all the way through. Turns out the press is for corn tortillas and you roll out the flour ones. Doh! So I’ve added corn tortillas to my list of things to try. I did try the press on this recipe and yes, like they said, it won’t work. However, that being said, flour tortillas are so easy to make it’s ridiculous. It only has five ingredients! The recipe I followed was this one but there are tons out there that are very similar. In a mixing bowl add 3 cups flour, 1 cup lukewarm water, 1 tsp salt, 1 tsp baking powder, and a third of a cup of vegetable oil. Using the dough hook mix the ingredients on low speed for a couple of minutes, scraping the sides as you go. 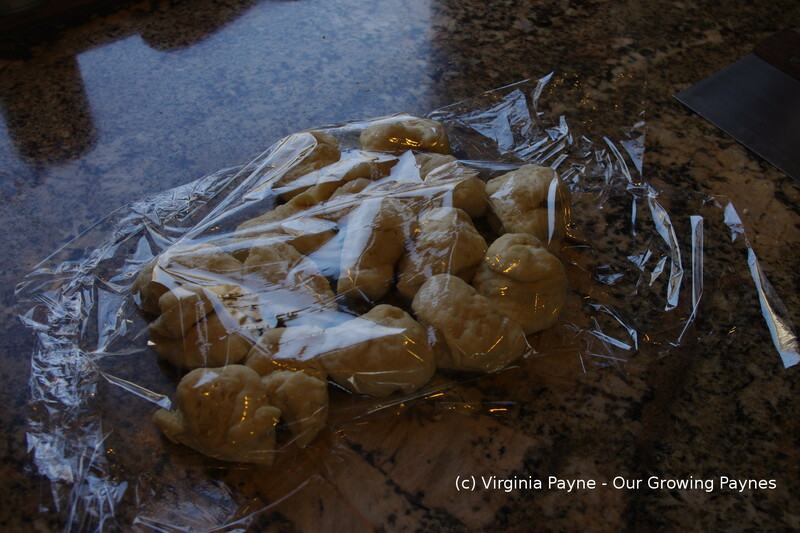 Once the dough comes together dump out on the counter that is lightly floured. Knead for a couple of minutes. 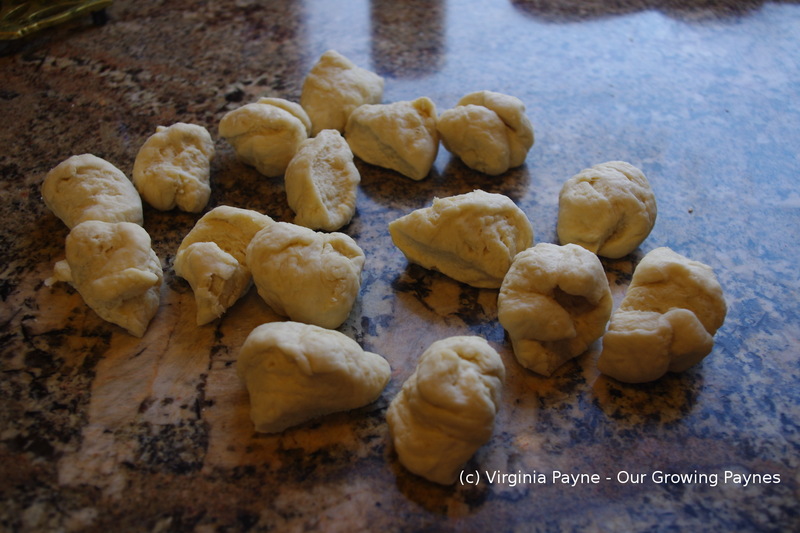 Divide the dough into 16 somewhat equal balls. Cover and let rest for about 15 minutes. Heat a skillet that will take tortillas 6-7″ in diameter. You want this hot but not so hot it will burn the tortillas. A golden brown is what you are going for. Roll out the first ball so it’s 6-7″ or so. You’ll want to keep the surfaces floured as well as the rolling pin. Also, don’t stack the dough. It will stick and be on the soggy side. The first one was as close to a circle as I got. 🙂 Brought to mind those who post comparisons of the pinterest pictures vs reality. So don’t stress if these aren’t shaped perfectly. They will still work and taste good. Place the first one into the skillet. While it is cooking roll out the next one. I got a sort of assembly line going. This process does go quickly as you only need to cook for a minute or so on the first side and just over half that on the second. They do puff up a bit and get all bubbly. When you flip them over press down to deflate the bubbles a bit. Don’t cook them too “firm” as you want them to fold easily when you eat them. So of course I did tacos. I did our normal mixture with a bit of beef and veg. I decided to do a different topping to our usual sour cream. Mash up an avocado, add about 1/3 cup of homemade salsa, a few squirts of lime juice, a bit of adobe seasoning, and some cilantro. This recipe makes 16 tortillas. The ones you don’t use freeze well until needed. So one more week of tax season and I can get back to reading everyone’s posts and having the usual chats. I hoped it would be different this season in keeping up with everything but it just proved to hard with everything going on. But next week I can’t wait to start the regular reading!